Children's Hope International: Bringing in the Year of the Rabbit! Bringing in the Year of the Rabbit! Did you celebrate Chinese New Year earlier this month? While at a Kansas City celebration Dina Ranes, adopted by proud parents Sean and Trisha in September 2009, had a rabbit painted on her face in honor of the Year of the Rabbit. The Chinese New Year event was presented by the Kansas City Chinese American Association. “If we keep sharing who we are, what we do and what Chinese culture is about, it will help out with understanding,” said one exhibitor in the article. “...From the parents’ side, we think we should keep a little bit of what we inherited.” Read more about this celebration and see Dina's photo, here. Sean & Tricia Ranes adopted their daughter Dina through Children's Hope in September 2009. Dina is pictured here with her grandmother. 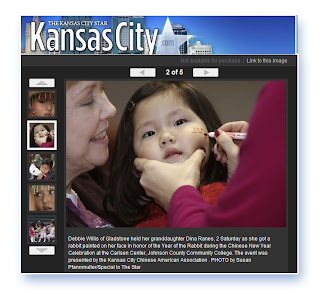 On February 5th, the family attended the Kansas City Chinese New Festival and were snapped by the Kansas City Star.